Provides a global menu item for easy access to your most used folders. Is there a better alternative to TopHat Folders Menu? Is TopHat Folders Menu really the best app in File Management category? Will TopHat Folders Menu work good on macOS 10.13.4? TopHat Folders Menu provides a global menu item for fast and easy access to your favorite and most used folders. Optionally Run without a Dock Icon. Add any folder or volume to the top of the menu. 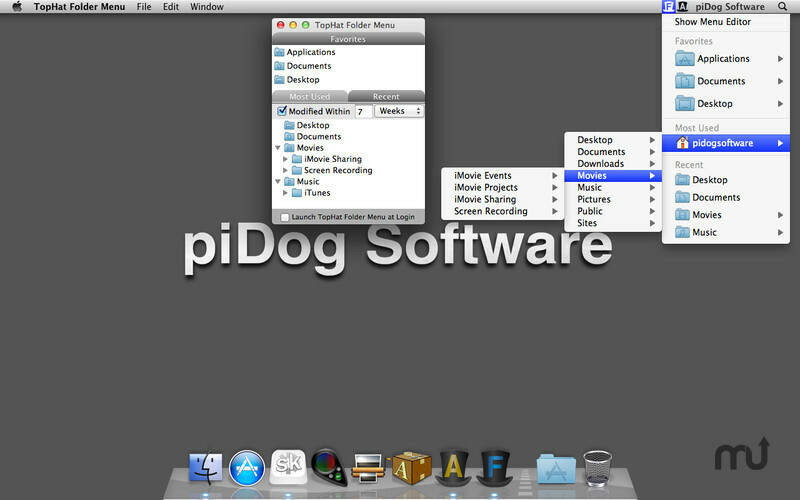 Display most used folders in order of use. Display recent folders for any time span you specify. Heirarchical navigation makes it simple to quickly drill down to the folder you need. Only displays folders to reduce clutter. Opens the selected folder in the finder. Improved error handling for OS X 10.7.4. Improved Icon loading for speed and reliability. Features not included in the lite version are no longer included in the options menu. TopHat Folders Menu needs a rating. Be the first to rate this app and get the discussion started!